I think this is my favorite book out of this series so far. I loved how the author is slowly but surely giving us glimpses of Knight’s past (and I do me slowly). I hope in the next book we can really get to know Knight. These two men clearly belong together but I could feel the hurt in Day due to the pain he could feel in Knight. To me this clearly shows an exceptional author because I really did feel exactly what the MC’s were feeling. In this book we find that Knight was finally going to give Day what he was clearly longing for and that was opening up to his partner. Even at the end I could see that we had a lot more to learn about both characters’ and I can’t wait to read the next installment. I would definitely recommend this book to all my friends but you really need to read this series in order. 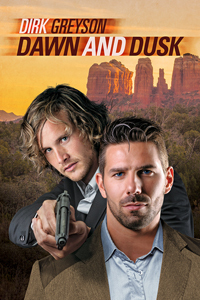 Dirk Greyson knows how to bring trouble to these two men without them even looking for it. As always with this series there are so many questions you ask yourself throughout the book and wonder if you will ever figure out who the good guys are. In this installment in the series it revolves around the mystery surrounding Days brother and the trouble he has gotten himself into. Knight finds himself questioning whether Stephen is a good guy or a bad guy and for Days sake he is hoping it is good but the trouble surrounding the mystery of Stephens disappearance and possible murder leaves him wondering more and more what the truth is. Day never believes his brother is a bad guy but in the events of his disappearance Day starts to crumble under the emotions of possibly never seeing his brother again. And if he will ever figure out just what happened to him. If it was not for Knight he may have very well caved to the pressure. I think that the longer that Day and Knight are partners the more that Day realizes that until he knows the whole story about Knights past and as to why Knights family was murdered that Knight will never truly be his. Even though Day can see that Knight cares about him, he still questions if he will ever let himself move on or not. I am really hoping that the next book has more in sight into Knights past because I think that until that situation comes to head there is never going to be a future for these two men even if that is what they may both end up wanting. I can’t wait till the next book. So far they have all been those books that u cannot walk away from because you want to know what happens next and I cannot see that the next book will be any different. Knight and Day are back home in America and this time they’re searching for Day’s brother along the US/Mexico border. Parts of this series are still uncomfortably close to Abigail Roux’s Cut and Run series. As backstories unravel, there are just too many similarities for me. Unfortunately, I haven’t engaged with Knight and Day with the same fervent devotion I felt for Ty and Zane, so any comparison tends to be unflattering to this series. People smuggling coyotes and Mexican drug lords offer new and interesting material for this story, but the double agents and competitive, secretive alphabet agencies are getting a little bit tired. The relationship between Knight and Day might actually, finally be a relationship – or not. The two men are still closeted and while there are romantic moments, I’m never quite sure if the two men aren’t just scratching an itch at times. The writing is tighter here than in the first two books and I enjoyed the final action sequence immensely. This is exciting and entertaining, but I’m still not very attached to the series and there aren’t enough continuing threads for me to care very much about the next installment. Dirk is very much an outside kind of man. He loves travel and seeing new things. Dirk worked in corporate America for way too long and now spends his days writing, gardening, and taking care of the home he shares with his partner of more than two decades. He has a Master’s Degree and all the other accessories that go with a corporate job. But he is most proud of the stories he tells and the life he’s built. Dirk lives in Pennsylvania in a century old home and is blessed with an amazing circle of friends.